This is one chicken yoghurt dish that I'll be cooking again! Hubby and the kids gave the thumbs up for this. I was actually looking around for curry recipes using my homemade yoghurt. There are many, many recipes, and looks like I found the right one. It is extremely easy to cook, no elaborate preparation and the ingredients can be prepared in minutes. Besides, I have two pots of coriander growing in my garden, and this would be perfect. The recipe calls for 1/2 cup of yoghurt, try putting in 1/4 cup first and gradually add more, depends on the level of sourness from the yoghurt. I use 1/2 cup as per the recipe. The chicken is simmered over low heat, stirring frequently until it is cooked, there is no water added to this recipe. After I have cooked and tasted this, I thought that my family will find it a little bit sour, but they loved it! This is really great with rice. I'm bringing this yummy dish to Mommy's Kitchen for Potluck Sunday. Cut chicken into serving pieces. Put onion, garlic, ginger, fresh coriander into the container of electric blender. Blend to a smooth puree. Heat oil in a saucepan and fry the blended mixture, stirring for about 5 minutes. Add tumeric, garam masala, salt and chili powder and fry for a further minute. Stir in yoghurt and tomatoes, and fry until liquid dries up and the mixture is the consistency of thick puree. Add chicken pieces, turning them in the spice mixture so they are coated on both sides, then turn heat low, cover tightly and cook until chicken is tender. First of all, I'm very excited to have been given my very first award! I'm gonna fill with the details right after this delicious flapjacks. This flapjack is absolutely fabulous. Crunchy Oat Flapjacks are crunchy right after baking but it gets chewier when it cools. This is easily the best flapjacks I have eaten, not that I have eaten that many flapjacks, as I am not a big fan of flapjacks. Each time when I flip through my book, I would always go back to this page. I am not particularly fond of flapjacks, but this recipe has really caught my attention. So in order to sort of put an end to it, I decided to give it a try. I was pleasantly surprised that after making and eating this, I have change my mind, flapjacks are indeed delicious, especially with a tall glass of very cold milk, yummy! I went ahead with the variation by adding raisins, make sure you soak them first so that they are juicy and plump. I only made half the recipe but I add more sunflower seeds, I use 2 tablespoons. If you do not have any particular favorite flapjack recipe, give this a try, this might just be the one! It is a great snack. Preheat the oven to 180 C/350F/gas mark 4. Gently melt the butter, brown sugar and golden syrup together in a saucepan set over a low heat. (Alternatively, microwave on high for 1-2 minutes). Gently stir in the whole porridge oats and cornflakes, taking care not to break them up too much. Spoon the mixture into the baking tin. Bake for 25 minutes, or until the flapjacks have turned golden and become firm. Remove from the oven and allow to cool for 10 minutes or so and then cut into bars. Leave the flapjacks to cool completely before lifting them out of the tin. Store in an airtight container. A handful of raisins (about 85 gm/3 oz) makes an excellent, juicy addition to these flapjacks. A tablespoon of roasted sunflower seeds adds an extra crunchy dimension. Exciting news! Good news! 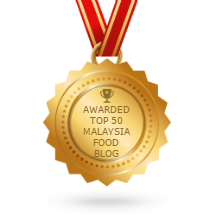 I have been given the following "Versatile Blogger Award" by one of the fabulous site whom I really admire, "The Ardent Epicure". As a new blogger with less than a year of blogging, it has been a wonderful adventure and fun way to meet other bloggers who have something very much in common, the love for food! For me, besides sharing our love of food, it is also a way to enable me to connect with friends from all over. It is a reward, when at the end of the day, or some stolen moments during my busy hour, when I sit down in front of my computer, I found someone out there, a blogger friend from far away, took sometime to read my posts and left a comment, however short, really makes my day. Thank you, friends! 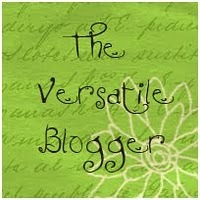 I am really honored to receive this Versatile Blogger Award. I am really excited to bits! The Ardent Epicure is a fabulous site comprises of three very talented persons and they are "Truffle Shuffle - Adam, Sugar and Spice - Grely and Magic of Spice - Alisha". 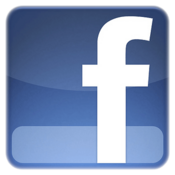 They have an outrageously fantastic site and fabulous, really fabulous recipes! Those of you who are familiar with them will know what I mean, if you have not look into their site before, please do, and you will see how much they enjoy food and their creativity and passion for good food really flows in their wonderful site. 1) I read cookbooks every night at bedtime. 2) Trying hard to resist buying more cookbooks! 3) Worked for 20 odd years, now SAHM and enjoying every moment of it. 4) Really love spicy food. 5) My favourite places to be : bookstore and the market. 6) I love gardening and dream of a big garden to grow my veggies, especially tomatoes! 7) Read Harry Porter twice! Please take a moment to click on all of the above and and make some new blogger friends. Have fun getting to know one another! Thank you to all my blogger friends out there for the support and making blogging such fun! Carrot and Coriander Muffins/Strictly for Adults? The smell of coriander when the muffins are being baked in the oven! A friend of mine happens to be around when I made this. Between the two of us and over a cup of tea, we finished about 5 muffins! I ate 2 and she ate 3 and took back home another 3. She really like this! (she took back some herb butter too!). I think that an addition of bits and pieces of cooked ham or bacon would be great! Ignore this if you are really health-consious! Preheat the oven to 180 degree C/350 degree F/gas 4/fan oven 160 degree C. Grease and flour 11 muffin tin sections or line with paper liners. Into a large bowl, sift the flour, baking powder, sugar, salt and black pepper. Add to the bowl any black pepper that didn't go through the sieve (strainer). Using a large metal spoon, stir in the chopped coriander, then add in the grated carrot and mix well. In a medium-sized bowl, beat together the eggs, milk and oil with a fork. Add the egg mixture to the flour mixture. Fold everything together with a large metal spoon until just combined. Spoon the batter into the prepared muffin tin sections. Bake for 23-25 minutes until well risen and the top springs back when gently pressed. Transfer to a wire rack to cool a little before eating. A simple spare rib dish that doesn't take much preparation, except that the spare ribs need to be fried first and then a quick braise in the sauce. Another simple chinese dish that is great with plain white rice and one of my family's favourite. Marinate spare ribs with marinade ingredients and set aside for 30 minutes. Heat oil. Mix spare ribs with the beaten egg and cornflour till well coated in a bowl. Deep fry on both sides till golden brown and crispy. Dish out and drain on paper towels. Mix sauce ingredients in a bowl together with the orange rind and adjust seasoning. Mixture should be a little sour, sweet and salty. In clean wok, heat about 1 tbsp cooking oil. Saute garlic and ginger till light brown and fragrant. Add in sauce mixture and let simmer over low heat for about 2 minutes. Stir in the fried spare ribs and continue to stir for 1 to 2 minutes. Add in cornstarch solution and stir until sauce has thicken slightly. Dish out to serving plate and serve hot. Enjoy. I'm bringing this to Potluck Sunday at Mommy's Kitchen. Making herb butter is really easy. I'm sure many of you already know how to make your very own herb butter with your favourite herbs. There's nothing more satisfying than using your own herbs from your garden to make the herb butter which can be used to toast bread, for roasting, salads and cooking. Here are a few recipes, you may change or add any favourite herb. Step 1 : Wash, drain and pat dry the herbs. Step 2 : Chop herbs to small bits. Step 3 : Mix the chopped herbs to the softened butter till evenly mixed. Step 4 : Place the herb butter on a big piece of parchment or baking paper. Step 5 : Roll it up and twist both ends. Leave it in the refrigerator for a few hours or overnight to firm up. Step 6 : When firmed, take it out from the fridge and cut to small rolls, place in an airtight container and store in the fridge. This is my favourite! The aroma is fantastic! Step 1 : Place garlic (do not remove skin) on a piece of aluminium foil. Drizzle the olive oil all over the garlic. Wrap it up like a parcel, twisting the top tightly. Bake in the oven at 190 degree C for 45 minutes. (The smell is fantastic!). Remove from oven and leave till completely cool. Step 2 : When cool, remove skin. Do not discard the excess oil in the aluminium foil. I usually keep it and use for cooking, it smells really wonderful! Step 3 : Use the back of a spoon to mash it to a paste. Step 4 : Mix it to the softened butter and stir till evenly mixed. Follow the steps to wrap, freeze and storing, same as above. This garlic butter is absolutely delicious with toasted bread. I would spread some of this aromatic butter on a piece of bread and toast it till marvelously crispy. Variation : You may add about 1 tablespoon of chopped rosemary leaves and use this when roasting chicken or baked potatoes. Yummy! This homemade yoghurt is gloriously creamy. Once you have tasted your own homemade yoghurt, you would have second thoughts about buying from the supermarkets. I have never thought that yoghurt is so easy to make, and no special equipment is needed except for a small cooking pot and a bottle to store, that's all! This is the fifth batch of yoghurt that I have made for the past six weeks! Once is just not enough. For flavoured yoghurt, just scoop some yoghurt in a bowl and mix with whatever you fancy, blueberry filling, strawberry sauce, fresh chopped fruits and I even mix it with homemade apricot puree. It can be used in baking, cooking and even in ice-cream. My daughter love to turn this into watermelon smoothies! I got this wonderful yoghurt making recipe from the magazine "flavours", contributed by Catherine Lau, our local cookbook author, with more recipes on uses of yoghurt. A thermometer might be useful, but it isn't necessary. I use the 'feel touch test' and it always worked out fine. Mine usually takes about 40-45 minutes for the milk to be at the right temperature before adding in the culture. If you have not made yoghurt before, try it out, it is very easy and takes just about 5-10 minutes to prepare, mix the culture at about 40-45 minutes later (depends on how fast the milk cools to the right temperature), and leave for it to set for 8-10 hours. Creamy plain yoghurt, good on its own! Delicious, blueberry flavoured yoghurt. I use blueberry pie filling. With fresh papaya and apples. Try it with fresh ripe mangoes or pineapples, strawberries.....your pick! I will be using homemade yoghurt to try out recipes, can't wait to try some of them!. Each batch that I made usually lasts only 2-3 days, enjoyed mostly by my kids. They don't ask me anymore whether have I bought any yoghurt, the question from them now is "Mommy, did you make any yoghurt?" Got to make a double batch next time! "The yoghurt produced with this set of instructions has a mild, refreshing tartness. You can control the acidity of the yoghurt by increasing or reducing the fermentation time : a longer fermentation produces more acidity." Step 1 : Heat the milk. Heat the milk over low heat, stirring gently, until bubbles begin to appear on the surface (82 to 85C); remove from heat. Heating the milk kills any unwanted microorganisms that may compete with the yoghurt culture, and it makes the yoghurt thicker. Step 2 : Cool the milk to lukewarm. The milk is ready when your fingers can comfortably dip in the milk for a few seconds. The ideal temperature is between 42 to 44C. The yoghurt culture multiplies too slowly below 42C, while a temperature over 44C kills the culture, both will not produce good yoghurt. First, add about 1/4 cup of the lukewarm milk to your culture and mix well. Then, pour this mixture back into the remaining milk and stir well. Pour the cultured milk into a clean, dry, 1 litre capacity glass jar, or any other non-reactive container, and put the lid on. Set the jar on the countertop in your kitchen and wait for the culture to convert the natural sugar (lactose) in milk to lactic acid which coagulates the milk into yoghurt. In our Malaysian weather, this typically takes 8 to 10 hours for cow's milk and 12 to 14 hours for goat's milk. Insulating your jar in a small styrofoam box of drink cooler cuts the fermentation time by half. To test for readiness, slowly tilt the jar to one side; cow's milk yoghurt is thick and will not flow much while goat's milk yoghurt is viscous and has the consistency of a pouring custard. Both yoghurts thicken some more upon refrigeration. Put the jar in the refrigerator immediately to slow down fermentation. Yoghurt will last for about 2 weeks, increasing in tanginess the longer you store it. Remember to use only a clean, dry spoon to scoop out the yoghurt from your jar to prevent premature spoilage. To obtain starter culture, buy a container of the best plain yoghurt with live cultures you can find. Because different brands do give different results, check the labels to ensure they contain yoghurt making bacteria such as Lactobacillus acidophilus, Lactobacillus bulgaricus, and Streptococcus thermophilus. Freese the yoghurt in 1 tablespoon portions. I usually buy a 1kg tub of Greek-style yoghurt and freeze it in ice cube trays. Thaw a cube in a saucer at room temperature before adding it to the lukewarm milk. You could reserve a tablespoon of your last home-made batch of yoghurt as starter culture, if you prefer, but I find that this method produces yoghurt that is inconsistent and decreases in quality with each subsequent batch. Soy yoghurt with live cultures are available at selected supermarkets in the Klang valley: use this as a starter in the same way as cow's milk yoghurt. Golden delicious pear and thyme. Both have a nice light fragrant. This is the third pear recipe this month! I bought these from the market, I guess that they must be in season now, as I seldom see this variety. It is very sweet and delicious. The pairing of this pear with thymes is wonderful. The cake turns out to be very moist and soft. This recipe calls for 1 tablespoon of thyme leaves, but I think that adding a little bit more, maybe half a tablespoon more, would give a slightly more stronger fragrance of the thymes, which I find that the original amount is not enough in terms of flavour and smell, as thymes has a lighter fragrant and taste unlike other herbs which can be very strong. Overall, this is a really nice cake to bake, it is so soft and moist. If you have some extra pears around, and some thymes in your garden, try making this lovely cake, it is great with a cup of hot tea. I'm bringing this to Potluck Sunday at Mommy's Kitchen. Set the oven to180C/350F/gas mark 4. Heat 30 gm/1 oz of butter and 30 gm/1 oz of the sugar together in a pan, until the sugar has dissolved. Add the diced pear and cook for about 5 minutes, until the pear is golden and caramelised. Leave to cool slightly. Cream the remaining butter and sugar together until light and fluffy. Add the eggs, a little at a time, stirring in between each addition, until the mixture is smooth and all the eggs are incorporated. Add the flour, and then stir in the cooled pears with any buttery juices, and the thyme. Spoon the mixture into the prepared tin and bake for 40 minutes, or until the cake is golden and springy. Allow the cake to cool in the tin, scatter with the extra caster sugar, and then cut into squares. Store in an airtight container. Bitter Gourd is just as its name, bitter. But the level of bitterness varies in the various types of bitter gourd. Either you like it for its bitterness or just stay away from it. Which one applies to you? Bitter gourd can be very tasty, it is actually very interesting to know how this bitter melon is cooked in every different country and culture. Wikipedia has some very interesting facts about this. For this dish, I use the Chinese bitter gourd variety, which is longer and bigger, lighter green in colour. I only use about half the melon, keeping the other half for omelette. Have you ever tried bitter gourd omelette before? It is very tasty too, one of my favourite omelette dish. I have a few bitter gourd plants in my potted garden. A few months back, I harvested a few bitter gourds and it was a real treat! I planted the smaller variety, which locally, we call it the Indian bitter gourd, this variety is more popular among the Indian community, and is very delicious when deep-fried till crispy, marinated with some spices and salt. Have you ever seen the flower of a bitter gourd? It is yellow and very delicate, you can catch a glimpse of how it looks like, just hop over to my potted garden, click here and here. For this dish, the amount of black pepper sauce to use, really depends on the brand that you have. Some brands may carry a more pungent and peppery, salty taste. The one I use is more to the mild peppery taste, I would prefer a sauce with a stronger taste of pepper, but when cooking for the family with kids, then this would be more suitable. Before adding any sauce to any stir-fry, I would suggest that, do a taste testing first, "get-to-know" your sauce, some of them can be very salty, then you need to adjust the seasonings accordingly. If you have not eaten bitter gourd melon before, then give it a try, you might be pleasantly surprised to find that you actually like it! Cut bitter gourd lengthwise into quarters. Cut diagonally across into thin slices. Repeat with carrots. Marinate minced pork with 1/2 tsp each of cornflour and water. Keep aside. Heat about 2 tbsp oil and fry bitter gourd and carrots together, stirring for about 3 to 4 minutes until cooked but not soft. Dish out and keep aside. Heat about 2 tbsp oil. Add in ginger slices and fry for about 1 to 2 minutes and add the chopped garlic. Saute until garlic turns light brown and fragrant. Add in minced pork. Stir until pork turns to white and cooked. Add in black pepper sauce and stir for about 1 minute. Add 3-4 tbsp of water and stir for a further 1 minute. Test for saltiness, black pepper sauce is usually salty enough, otherwise, a little salt or light soy sauce may be added according to taste. Add in the bitter gourd and carrots, give a quick stir , if using Chinese cooking wine, add in now. Dish out to a serving plate. Serve hot. Great with plain white rice. Jam, preserves, jellies, marmalades? Conserve, spread, curd, butter? I'm sure you are familiar with these but do you know the difference among them? I'm sure you do, but I'm a bit confused when it comes to jam and preserves, jellies and spread, curd and butter? Well, these are explained in the book "50 Step-By-Step Homemade Preserves" by Maggie Mayhew. I bought this book mainly because it is cheap and I have not tried making jam before. So this would be great start to test out my jam-making adventure. This book has only less than 100 pages but there's beautiful photographs for every recipe. The first recipe which I have made many times is Dried Apricot Jam, which is really good. Can anyone suggest any good books on preserves, pickles and canning? Preserves : The art of preserving foods such as jam, jellies and other sweet preserves. Jam : Jams are usually made with whole or cut fruit, jam should have distinct flavour, bright colour and soft set. Conserves : These are very similar to jams, but they have a slightly softer set and contain whole or large pieces of fruits. The fruit is first mixed with sugar and sometimes a little liquid, then allowed to stand for several hours or even days. The sugar draws out the juices from the fruit, making it firmer and minimizing the cooking time needed. Jellies : Jellies are made using the juice strained from simmered fruit, which is then boiled with sugar to setting point.There is very little preparation of fruit, other than giving it a quick rinse and roughly chopping larger fruit, but you do need to allow plenty of time to make the jelly itself. The secret to a beautifully clear jelly lies in straining the fruit pulp through a jelly bag, drip by drip, which takes several hours. Marmalades : This preserve consists of a jelly base, usually with small pieces of fruit suspended in it. The name marmalade is derived from the Portuguese word marmelo, meaning quince, and it was from this fruit that marmalades were first made. Modern marmalades are usually made from citrus fruits, or citrus fruits combined with other fruits such as pineapple, or flavoured with aromatic spices. Marmalades can range from thick and dark to light and translucent. Fruit Curds : Fruit curds are usually made with the juice of citrus fruits, but other acidic fruits such as passion fruit may be used. The juice and puree is heated with eggs, butter and sugar until thick. Fruit Butter : Smoother and thicker than jam, fruit butters have a spreadable quality not unlike dairy butter. Many recipes also contain a small amount of butter. Fruit Cheeses : These sweet, firm preserves are known as cheeses because they are stiff enough to be cut into slices or wedges rather like their dairy counterparts. They may be made either from fresh fruit, or from the pulp left from making jellies. Bottled Fruits : This is a traditional method of preserving fruit in syrup. I bought half-ripen pears. They are slightly soft but not mushy, and very sweet! Stir over low heat until sugar dissolves, as in Step 5, mixture will get very hot as it boils. Use a small but deep saucepan and use a wooden ladle with a long handle to avoid hurting your hands from the heat. (don't ask me how I knew!). Did you notice the different wooden spoon from the photo below??? As mixture continues to boil and thickens, the mixture will splatter now and then, though it is only a few drops, it is very, very, hot, ouch! Wear an oven glove or mitten! (again, don't ask me how I knew!) ....... Even though, the recipes says, stir for about 15 minutes, I did mine for about 30 minutes, (maybe because I use very little sugar, it takes a longer time to caramelize and thickens! Phew, at last, it's done! Can you see the speckled vanilla seeds. Time to store this in a cool, dark place for at least 2 days! The taste does gets better after a few days, BUT, I can really taste the sourness from the lemons, I'm going to reduce the lemons to 2 instead of 3 IF I make this again, it will definitely reduce the pectin from the lemons, may have to add some liquid or powdered pectin. The sweetness is just right, even though I used a small amount of sugar, I can taste its sweetness. Overall, this pear butter is not too bad, I wouldn't say it is fantastic, but it is OK. I prefer the dried apricot jam! The delicate flavour of pears is enhanced by vanilla in this butter that really captures the essence of the fruit. It is well worth allowing it to mature for a few days before eating. Place the pears in a large pan with the lemon juice, water and vanilla pod. Bring to the boil, then cover and simmer for 10 minutes. Uncover the pan and continue cooking for a further 15-20 minutes, or until the pears are very soft. Remove the vanilla pod from the pan, then carefully scrape the seeds into the fruit mixture using the tip of a knife. Tip the fruit and juices into a food processor or blender and blend to a puree. Press the puree through a fine sieve (strainer) into a bowl. Measure the puree into a large heavy pan, adding 275gm/10oz/1-1/3 cups warmed sugar for every 600ml/1 pint/2-1/2 cups of puree. Stir the mixture over a low heat until the sugar dissolves. Increase the heat and boil for 15 minutes, stirring, until the mixture forms a thick puree that holds its shape when spooned on to a cold plate. Spoon the pear butter into small, warmed sterilized jars. Seal, label and store in a cool, dark place for at least 2 days before serving. Fruit butters have a soft spreading consistency - thicker than fruit curds, but softer than fruit cheeses. They make an excellent tea time preserve. Fruit butters keep well in sealed jars and can be stored for up to 3 months. Once opened, they should be stored in the refrigerator. I love dried apricots. They are really yummy with a unique tangy taste unlike any other fruits that I have tried. This Apricot and Oats Slices are really good with a cup of hot tea. It is great as a snack or treat yourself to a slice anytime of the day! This recipe is so simple and easy to follow. Another great recipe from Liz Franklin's "brownies and bars" . When eaten it barely warm, the crumble has a very light crispy crumbly texture, which is very nice. The taste gets even better the next day, when the crumble has soften and the apricot has cooled and set. Do this in the evening, and enjoy it for breakfast, if it can last that long! I will make this again, for sure. This recipes makes a rather large slice. For half the recipe, I use a 7x7 inch baking pan. I would advise that all four sides of the pan, lined with parchment paper, to avoid the apricots becoming too dark at the sides of the pan. I mashed the apricots lightly even though the recipe doesn't call for it, its your preference. You can still see bits and pieces of the apricots, a little bit chewy in every bite, just as I like them! Preparation time : 1 hour, plus cooling. To make the filling, put the apricots and sugar in a saucepan with 100 ml/4 fl oz water. Simmer for 10 - 15 minutes, until the apricots are soft. Remove from the heat and leave to cool. Preheat the oven to 190 degrees C/375 degrees F/gas mark 5. Rub the butter and flour together until the mixture resembles coarse breadcrumbs. Add the sugar and oats. Sprinkle half of the mixture over the base of the tin and press down gently. Spread the apricot mixture over the base. Scatter the remaining crumble evenly over the apricots. Bake for 25-30 minutes, until golden brown. Remove from the oven and cut into squares or slices. Store in an airtight container. There's only one word to describe it when I took the first bite, Wow! Second bite, Mmmm..... , Third Bite, Mmmm......... It was mmmm....... all the way to the last bite, then I reached out for the second piece! This is the most delicious tart I have ever tasted! The bottom layer, which is the sweet dough, is so delicate and when you bite into it, its texture is tender and crumbly soft, with a buttery taste and sweetness from the sugar, all blended into one delicious crust. The center layer is the almond cream which is made from ground almonds, butter, sugar, egg and some flour. The top layer is the pear, either canned, poach your own or you can use fresh ripe pear as it is. One slice is not enough! The instructions for the dough and the pear tart may seem long and tedious, but it is actually quite easy to do. The only thing that is difficult to handle is the dough pastry, it is so soft and sticky, which makes it difficult to press onto the tart pan. I guess that it takes a lot of practice to master this step. I use a 8 inch tart pan since I am not confident that I can fit all of the dough into a 9 inch pan. The rest of the instructions are really simple and easy to follow. The steps may seem lengthy, if you chose to use canned pear, then just follow the steps for canned pear. Ms. Dorie Greenspan has included three options for choices of pear that can be used successfully. Just pick the one most suitable for you. I'm lazy, I go for the canned pears. The dough is ready to be baked. Can you see the side where the crust has broken? It happened when I lifted off the aluminium foil from the crust. So be extra careful not to press the aluminium foil too tight against the crust before baking. The lovely tart is then brushed with some apricot gel after it has cooled. The smell is so mouth-watering! My kids love this pear tart! My daughter has requested me to make this again next week! Looks like I have to make a double batch of the dough and freeze it. This is truly a French classic tart. If you eat a slice of it by holding it in your hand and just bite into it, then the delicate, tender crumbs will only melt in your mouth, if you use a spoon to break a piece, then part of the crumbs will be on your plate! So, use your hands instead, why waste all the delicious crumbs, they should be in your mouth and not on your plate, and besides, you will have a plate and a spoon less to clean! Now for the recipes, since this calls for two separate recipes, I have posted it separately, otherwise this posting will be very long. For the crust recipe, please click Sweet Tart Dough, and it will lead you to a journey of the most delicate, tender, crumbly delicious crust! 1 9-inch shell made with Sweet Tart Dough or Sweet Tart Dough with Nuts, partially baked and cooled. Confectioners' sugar, for dusting, or 1/4 cup apple jelly mixed with 1/2 teaspoon water, for glazing. TO POACH THE PEARS : Peel the pears and leave them whole. Bring the water, sugar and lemon juice to a boil in a saucepan just large enough to hold the pears. Add the pears to the boiling syrup, lower the heat so the syrup simmers and gently poach the pears until they are tender when pierced with a knife, about 15 minutes. Cool the pears to room temperature in the syrup. When you are ready to use the pears, discard the syrup. (If you want, you can refrigerate the syrup for up to 1 week and use it to poach another batch of pears). TO MAKE THE ALMOND CREAM : Put the butter and sugar in a food processor and process until the mixture is smooth and satiny. Add the ground almonds and process until well blended. Add the flour and cornstarch and process to blend, then add the eggs. Process for about 15 seconds more, or until the almond cream is homogeneous. Add the rum and process just to blend. (If you prefer, you can make the cream with a mixer fitted with the whisk attachment or in a large bowl with a hand mixer). You can either use the almond cream immediately or scrape it into a container and refrigerate it until firm, about 2 hours. (The cream can be refrigerted for up to 2 days or packed airtight and frozen up to 2 months; defrost before using). GETTING READY TO BAKE : Center a rack in the oven and preheat the oven to 350 degrees F. Line a baking sheet with parchment or a silicone mat. If you are using unpoached fresh pears, peel them now. Cut the poached or unpoached fresh pears in half from blossom to stem and core them. Rub the unpoached pears with lemon juice. Pat the fresh or canned pears dry so that their liquied won't keep the almond cream from setting. Fill the baked crust with the almond cream, spreading it evenly with an offset metal icing spatula. Thinly slice each pear half crosswise. Lift each half on a spatula, press down on the pear to fan it slightly and place it over the almond cream, wide end toward the edge of the crust. The 6 halves will form spokes. Put the tart on the baking sheet. Bake the tart for 50 to 60 minutes, or until the almond cream puffs up around the pears and browns. Transfer the tart to a rack to cool to just warm or to room temperature before removing the sides of the pan. Right before serving, dust the tart with confectioners' sugar or warm the apple jelly with the water and brush this glaze over the surface of the tart. This is one tasty dish. For those who love ginger and love chinese food, then you should give this a try! It is so full of flavour, the taste of ginger and the marinated chicken with the soy sauce and the rice wine, really blends well together. It doesn't only taste delicious, it smells great too. You can add in as much ginger as you want and if you are the kind that loves gravy, then add in a little extra water, or just let it simmer till it is fairly dry, to your liking. This wonderful recipe is from our fellow blogger Rice Palette who has other great recipes on Chinese Stir-Fry. Rice Palette has inspired me to do a monthly posting on any recipe from another fellow blogger. I think that this is a great idea to bring more blogger friends together! The perfect way to do this, is through our blogs via delicious, fantastic food! I couldn't think of a better and fun way to do this. So, for a start, please do drop by http://www.ricepalette.com for the full recipe and instructions on how to cook this lovely tasty dish. Have fun trying it out and I'm sure, that you will cook this again! I definitely will! I'm sure you can almost smell the fragrance of the ginger and chicken........mmm.. Delicious with plain white rice. I could just eat this with two bowls of rice! This is a light lemony sherbet. It turned out to be a little bit tangy, because I reduced the sugar, but with the addition of honey as the topping, this is fantastic! Honey and lemon, they are a perfect combination! I like to eat this a little bit mushy, take it out from the freezer and leave it for about 5 minutes until they are soft enough to scoop, then leave it for another 3-5 minutes until it is a little bit more soft and mushy (when you use your spoon to scrape, it will break down easily! ), this is when you drizzle some honey (as much as you want!) and enjoy. Delicious, lemony tangy and honey sweet, my.... (are you drooling now.......?). Go on, do a batch! In a medium, nonreactive saucepan,mix 1 cup (250 ml) of the milk with the sugar. Grate the zest of the lemon directly into the saucepan. Heat, stirring frequently, until the sugar is dissolved. Remove from the heat and add the remaining 2 cups (500 ml) milk, then chill thoroughly in the refrigerator. Stir the lemon juice into the milk mixture. If it curdles a bit, whisk it vigorously to make it smooth again. Freeze in your ice cream maker according to the manufacturer's instructions.